The purpose of creating this set of rules is an attempt to set standards for C# coding that would be convenient and practical at the same time. Not all of these rules have definitive ground. We simply accepted some of them as standards. After all, it does not matter what you choose, but rather how strictly you follow the selected rules. The static code analyzer VisualStudio (also known as FxComp) and StyleCop can automatically apply many coding and formatting rules by analyzing compiled assemblies. You can configure them to analyze at compilation, or make analysis part of the daily assembly. This document contains additional rules and recommendations, while the website www.csharpcodingguidelines.com provides code analysis guidelines, required depending on what code base you are using. how to gain insight into another developer's elegant, yet abstract code. Don't Repeat Yourself (DRY). Abstain from duplicating code within one component, repository or bounded context, and keep in mind the rule of three. The four principles of object-oriented programming: encapsulation, abstraction, inheritance, and polymorphism. Generally, you do not have to make the entire code base compliant with these guidelines. Nevertheless, it should comply as much as possible. A class or an interface must have a single purpose in the system, in which it is used. Usually, a class describes a type, e.g. email or ISBN (international standard book number), or represents an abstraction of a business logic, or describes a data structure, or provides interaction with other classes. It must not combine these functions. This rule is known as the Single Responsibility Principle, one of the SOLID principles. Tip: A class with the word "And" in its name clearly breaks this rule. Tip: Use design patterns for interactions between classes. If you fail to apply any pattern to a class, the class may have too much responsibility. Note: If you are creating a class, the describes a primitive type, then you can simplify its use by making it unchangeable. The created object should not require setting additional properties before using it, whatever its purpose. If the constructor requires more than three parameters (which violates the rule ELMA1561), perhaps the class takes too much responsibility (violates the rule ELMA1000). An interface must have a name that clearly describes its purpose and role in the system. Do not combine vaguely related elements into one interface just because they pertain to one class. Create interfaces based on functionality, for which the invoked methods are responsible, or on a specific purpose, the interface serves. This rule is known as the Interface Segregation Principle. If you want to expose an extension point of your class, expose it as an interface, not a base class. You do not want to make the users of this extension point create their own implementations based on the base class, which may misbehave. Although, for convenience, you can create a default implementation (abstract class), which can serve as a starting point. Using a framework for implementing dependency injection, you can compile class selection logic depending on the requested interface in one place. Static classes are often the reason behind bad code unless static classes are used to create extension methods. They are also very difficult if at all possible, to test in isolation, until you start using very sophisticated tools. Note: If you do need a static class, mark it as static. In this case, the compiler will forbid creating instances of this class and initialize your class before accessing it for the first time. This will rid you of the necessity to use a private constructor. pocketBook.Print();  // Will display "Printing PocketBook"
((Book)pocketBook).Print();  // Will display "Printing Book"
There should be no difference between invoking the Print() method by referencing a base class or as a derivative class method. In other words, the behavior of child classes should not contradict the behavior, defined by the base class, i.e. it should be expected for the code, using a variable of the base type. A well-known example of breaking this rule is the NotImplementedException exception when it occurs when redefining a base class method. Note: This principle is also known as the Barbara Liskov substitution principle, one of the S.O.L.I.D. principles. If there are dependencies on child classes in the parent class, it breaks the principles of object-oriented programming and prevents other developers from inheriting from your base class. If your code looks like the code below, it breaks the Law of Demeter. An object should not allow accessing the classes on which it depends because user-objects may use properties and methods incorrectly to access objects behind them. By doing so, you allow the invoked code and the class you use to incorporate into a single whole. Thus, you limit the possibility to replace one implementation with another in the future. Note: Using a class, implementing the Fluent Interface, may seem as a violation of this rule. But invoked methods simply pass the invocation context to the next element. Thus, it does not cause contradictions. Exception: When using inversion of control and dependency injection frameworks, it is often required to expose dependencies as public properties. Until these properties are used for something else but implementing dependency injection, this should not be considered as a violation of the rule. Bi-directional dependency means that two classes know about each other's public methods or depend on each other's internal behavior. Refactoring or replacement of one of these two classes require changing both classes and may result in a lot of unforeseen work. The most obvious solution is to create an interface for one of the classes and use dependency injection. Exception: Domain models used in Domain Driven Design can use bi-directional dependencies, describing real-life associations. In such cases, you should make sure that they are absolutely necessary and avoid them if possible. If your repository contains multiple classes, which only describe data, then most likely you have several classes (static) that contain big data processing logic (see rule ELMA1008). Use the principles of object-oriented programming according to the recommendations in this section. Move your data processing logic to the data, which it uses. Exception: The only exception from this rule are classes, used for transferring data between applications, also known as Data Transfer Objects, or classes, used as wrapping for method parameters. Properties should not depend on other properties. In other words, it should be no different which property you set first. For instance, first DataSourc, then DataMember or vice versa. The work is more expensive than setting the field value. The property represents conversion. For example, Object.ToString method. The property returns different values for each invocation, even if arguments do not change. For example, the method NewGuid will each time return a new value. Using the property leads to a side effect. For example, internal state change, which is not directly related to the property (it breaks the command-query responsibility segregation (CQRS)). Exception: Internal cache fill in or lazy-loading implementation are good examples of exceptions from this rule. If you have properties, that cannot be used at the same time, it means that they represent two mutually exclusive concepts. Even if these concepts can have certain common logic and state, obviously they have different and incompatible rules. This rule is often broken in the domain model, when properties encapsulate all the possible types of conditional logic, containing mutually exclusive rules. It often creates a wave effect and maintaining such code becomes harder. Same as a class (see rule ELMA1000), each method must have only one responsibility. Stateful objects contain multiple properties and the logic that these properties encapsulate. If you make such an object public via a static property or another object's method, then it will be difficult to refactor and unit-test classes, that depend on the object with a state. Generally, using the structure described above is a good example of breaking many guidelines, described in this chapter. A classic example is the HttpContext.Current property in ASP.NET. Many consider the HttpContext class a source of ugly code. In fact, one of the testing rules — Isolate the Ugly Stuff — often pertains to this class. Usually, there is no need to let users change the internal collection, which is returned as the result of method invocation since it breaks encapsulation. Do not return an array, set or another collection class directly. Instead, return IEnumerable<T> or, if the user needs to know the number of items in the collection, ICollection<T>. You can also use IReadOnlyCollection<T>, IReadOnlyList<T> or IReadOnlyDictionary<TKey, TValue>. Users may not expect null to be returned as the result of a method execution. Always return an empty collection or string instead of null. Among other things, it will relieve you from the necessity to cram your code with additional checks for null or worse, use string.IsNullOrEmpty(). If a class element requires a part of data of another class as parameters, define the data types of these parameters very specifically and do not assume an entire object as a parameter. For example, consider a method that requires passing as a parameter a certain connection string, described in a central interface IConfiguration. Instead of depending on the entire configuration that implements this interface, pass only the connection string. It will not only allow you to reduce the number of dependencies in the code, but also improve long-term maintainability. Note: To remember this rule, use this phrase: Do not use a truck to deliver a single package. Instead of using strings, integers and fractions to represent such specific types as ISBN (international standard book number), email address or money sum, create an object for each type that will include both the data and the validation rules applied to the data. By doing so, you can avoid multiple implementations of the same business rules. It will improve maintainability of your code and reduce the number of bugs. A code base that uses a returned status message to define whether an operation completed successfully or failed often has nested if expressions throughout the code. Often users forget to check the returned value. Structured exception handling was introduced to allow you to generate exceptions and detect or replace them on a higher level. In most systems, it is a general practice to generate exceptions each time an unexpected situation occurs. A message must clarify, what caused an exception, and clearly state what to do to avoid it in the future. For instance, if a method accepted null as an input parameter, generate ArgumentNullException instead of ArgumentException. Do not ignore errors by handling general exceptions, such as Exception, SystemException and others, in the application code. Only the top level error handler should capture general exceptions for logging and correct completion of the application runtime. Exceptions that occur within the async/await blocks and inside Task apply to the task that awaits the execution of these blocks. Exceptions that occurred in the code preceding async/await and Task, apply to the invoking code. An event that has no subscriptions equals null. Thus, before invoking it, make sure, that the list of delegates, representing the event, does not equal null. Invoke the event with a Null-conditional operator. It will prevent the delegate from being changed by competing flows. Following this recommendation will allow derivative classes handle a base class event by redefining the protected method. The name of the protected virtual method must be the same as the event name, but with the On prefix. For example, the protected virtual method for an event named TimeChanged must be named OnTimeChanged. Tip: You do not have to invoke base class implementation from the classes, which redefine the protected virtual method. The base class should continue working correctly, even if its implementation is not invoked. A property change notification event should be named like PropertyChanged, where Property should be changed to the name of the property, to which the event is related. Tip: If your class has multiple properties, which require corresponding events, try implementing the INotifyPropertyChanged interface instead. It is often used in the patterns Presentation Model and Model-View-ViewModel. Often an event handler is used for handling similar events from many senders. In this case, the passed argument is used to pass the event invocation context. Always send a reference to the context (usually, this) when invoking an event. Also do not send null when invoking an event, if it does not contain data. If an event contains no data, send EventArgs.Empty instead of null. Exception: For static events, the passed argument must be null. Since LINQ-queries use delayed execution, returning q will return the expression tree, representing the abovementioned query. Each time a user calculates the result using foreach or something similar, the entire query is executed again, each time creating new instances of GoldMember. Consequently, you will not be able to use the operator == to compare different instances of GoldMember. Instead, always calculate the LINQ-query result, using ToList(), ToArray() or similar methods. Usually, there is no need to know on which level a member is declared in the class hierarchy. If this level is stated in the code, refactoring becomes trickier. A method that includes more than 7 declarations most likely performs to many functions or takes too much responsibility. In addition, human memory requires a method to be short. It is unable to hold many things at the same time to accurately analyze and understand what a code fragment does. Divide a method into several smaller ones, with clear purpose and names that indicate what they do. Make sure that the working algorithm of this part of the program remains understandable. To make a more weighted decision on which elements will be available to other classes, first, limit their visibility. Then, think carefully which members or types to make public. Double negation is harder to comprehend than a simple expression, and people tend to get confused. As an example, consider a class group compiled under the namespace EleWise.ELMA.CRM, which is in a specific assembly. According to this guideline, this assembly must be named EleWise.ELMA.CRM.dll. Exception: If you decide to combine classes from different unrelated namespaces in one assembly, add the Core suffix to its name. Do not use this suffix in namespace names. For example: EleWise.ELMA.CRM.Core.dll. Use the pascal notation for naming files and do not use underscores. Do not include generalized parameters and their number in names. Note: Using underscores is acceptable for prefixes, such as Locko_Application.cs, BUD_BudgetTeam.md. Exception: Nested types must be part of the same file. Exception: The types that are different only in the number of generalized parameters must be in the same file. If the value of one constant depends on the value of another, state this in your code. Note: Enumerations may often be used as a storage for symbolic constants. var item = 3;                       // What type? int? uint? float? In all three examples, the type of the values assigned to variables is obvious. For more information about using var, read Eric Lippert's article Uses and misuses of implicit typing. Avoid the C and VisualBasic language style, when all the variables are declared at the beginning of the unit. Declare and initialize each variable only when it is necessary. while (((condition == true) == true) == true)// where do you stop? Updating a cycle variable inside a cycle body make the code confusing. Especially, if the variable is changed in more than one place. index = 11; // Wrong! Instead use ‘break’ or ‘continue’. Methods containing nested cycles are harder to understand than those containing one cycle. In fact, in most cases cycles can be replaced with a much smaller LINQ-query, which uses the from keyword two or more times to unify data. if (isActive) if (isVisible) Foo(); else Bar(); // to which ‘if’ ‘else’ pertains? If the default block is empty, add a comment. In addition, if this block should not be reached, generate InvalidOperationException when it is invoked to detect future changes that may fall through the existing cases. This will allow you to write better code, because all the script execution scenarios have been thought through. // Not supposed to end up here. // What should happen when this block is reached? Ignore it? // If not, generate InvalidOperationException. One entry — one exit is a reasonable principle. It helps keep the method execution understandable. If the method is small and complies with ELMA1500, then several declarations of return may be relevant and will improve code readability. For example, if a method returns a logical value, it is more convenient to use two return declarations instead of a logical variable, which the method will return and to which values will be assigned during the execution. To understand what this code does you are going to need to analyze its details and predict all the execution results. Sure, you can add a comment before the code, but it would be better to replace a complex expression with a method, with a self-explanatory name. Should you need to change this method, you are still going to need to figure out how it works. But now it is much easier to understand the code that invokes it. The MyString class provides three overloads of the IndexOf method, two of which call the other with a lot of parameters. Note, that this rule applies to class constructors. Implement the more overloaded constructor and call it from other overloads by using the this() operator. Also note, that parameters with the same names must be in the same order in all the overloads. Important: If you want to change class behavior by redefining these methods, declare the most overloaded method as non-private virtual method, invoked by all overloads. If an optional parameter is a reference type, then its default value can only be null. However, as we know, string, list, and collections must never equal null (as per the rule ELMA1135). Therefore, you should use an overloaded method instead. Note: The compiler copies the value of optional parameters to the call site. Therefore, changing the default value for optional parameters should be accompanied with recompilation of the invoking code. Note: When a class method is used via an interface, passing optional parameters is unavailable until the object that contains this method is cast to the respective class. For more information, read Eric Lippert's article. C# 4.0 named arguments were created to simplify invocation of COM components, which are known to offer tons of unnecessary parameters. If you need named arguments to improve readability of the method invocation, most likely this method has too much responsibility and must be refactored. If your method or constructor assumes more than three parameters, use a structure or class to encapsulate them in accordance with the Specification pattern. Generally, the fewer parameters there are, the clearer the method. Furthermore, unit-testing of a method with multiple parameters requires numerous testing scenarios. Exception: When using inversion of control and dependency injection frameworks, it is often necessary to set dependencies as parameters in a constructor. Until these parameters are used for anything but dependency injection implementation, this should not be considered breaking the rule. They make code less readable and potentially cause errors. Instead, return compound objects as the function execution result. Usually, if a method assumes bool as a parameter, it is doing more than one thing and requires refactoring into two or more methods. An alternative is replacing the bool with an enumeration. Never use a parameter as an internal variable. Even if a parameter type matches the type you need, the name usually does not reflect the purpose of the temporary variable. If you use the as operator to cast an object to a specific interface, always check the result it returns for null. Failing to follow this guideline may cause NullReferenceException on a much later stage of program execution, if the object does not implement the required interface. Never send commented code to repository. Instead, use a task tracking system to see what work has to be done. Nobody will know the purpose of a commented code fragment. Was it temporarily commented for testing? Was it copied as an example? Should I delete it? All the class members, parameters, and variables must be named using American English words. Choose a simple, readable, grammatically correct name. For example, HorizontalAlignment is more readable than AlignmentHorizontal. Prefer readability to size. A property name CanScrollHorizontally is better than ScrollableX (an ambiguous X axis reference). Avoid using names that conflict with programming keywords. Exception: In most projects, you can use words and phrases from a domain area typical for this application, as well as names specific to your company. The static code analyzer Visual Studio will analyze the entire code, therefore you may need to add these terms to the custom code analysis dictionary. In most cases, they are poor excuses for not defining a clear and self-explanatory name. For example, do not use g_ or s_ to distinct static and non-static fields. Usually, if it is hard to tell apart variables from class fields in a method, then this method is too clumsy. Here are some examples of incorrect names: _currentUser, mUserName, m_loginTime. For instance, use OnButtonClick instead of OnBtnClick. Avoid using single characters in variable names, such as i and q. Instead use full words, such as index and query. Exception: Using common acronyms and abbreviations may be an exception. For example, using UI instead of UserInterface and Id instead of Identity. Use a name that points at a function, that a class name performs. For example, the name GetLength is better than GetInt. Do not use such terms as Enum, Class or Struct in names. Variables, referring to collections, must be named in plural. For example, the name IComponent consists of a noun, the name ICustomAttributeProvider consists of a phrase, and the name IPersistable consists of an adjective. Bad examples: SearchExamination (a page for searching examination results), Common (lacks a noun, does not explain the purpose) and SiteSecurity (although technically OK, the purpose is unclear). Do not use in class names such terms as Utility or Helper. Classes with such names are usually static and designed without regard to the principles of object-oriented programming (see also rule ELMA1008). Always add Т prefix to descriptive names of type parameters. Always use descriptive names if a name consisting of one letter is not clear as it is. In this case, use the letter Т as a type parameter name. It is recommended to specify restrictions applied to the type parameter in the type parameter name. For example, a parameter intended only for ISession may be called TSession. .NET developers are already accustomed to naming patterns, which are used in .NET Framework. Following these patterns will make it easier for them to read your code. For example, if you define a class that implements a collection, name the methods for deleting, adding and getting the number of items like Add, Remove and Count instead of AddItem, Delete, or NumberOfItems. Name properties using nouns, noun phrases or sometimes adjective phrases. Name a property of the logical type using affirmative phrases. For example, CanSeek instead of CannotSeek. Try using prefixes Is, Has, Can, Allows or Support in the names of properties of the logical type. Try naming a property the same as its type. When you create a property of the enumeration type, the property name may be the same as the enumeration type name. For example, if you have an enumeration CacheLevel, then the property returning one of its values also must be named CacheLevel. Use methods and local functions using such verbs as Show or such verb-object combinations as ShowDialog. A good name must hint at what a method does and, if possible, why. Also do not use the word And in the names of methods or local functions. It means that a method or a local function has more than one function which breaks the single responsibility principle (ELMA1115). Note: Make sure that namespace names never contain type names, unless it is a plural noun, e.g. Collections, which is usually acceptable. For example, an event that precedes the closing of a window should be named Closing, and the event that occurs after closing the window — Closed. Do not use Before and After or any suffixes to identify such events. Deleting: Occurs right before deleting the object. Delete: Occurs when the object must be deleted by the event handler. Deleted: Occurs when the object is already deleted. A good practice is adding the On prefix to the name of a method that handles an event. For example, if a method handles the Closing event then the name should be OnClosing. If an extension method name conflicts with another element or extension method, you should add a prefix in the form of invocation class name. Adding them to a related class with the Extensions suffix will improve readability. Adding the Async suffix to methods that return Task and Task<TResult> is common. If a method with this name already exists, then use the TaskAsync suffix instead. If a method or another element returns IEnumerable<T> or another collection class that does not provide the Count property, use the extension method Any() instead of Count() to check the collection for being empty. If you use Count(), you are risking performance reduction, since it will lead to iteration of the entire collection (for example, in case of IQueryable<T> a data query will be executed). If you return IEnumerable<T> to prevent changing the returned collection, try using new read-only classes as recommended in the rule ELMA1130. Using async will not automatically starting anything in the work thread, as the Task.Run. Async does; it will simply add the necessary logic that allows releasing the current thread and returning the result to the same thread after completing an asynchronous operation. In other words, use async only for operations, related to input/output. If you need to execute an operation related to allocating additional CPU resources, use Task.Run to offload the work to another thread from the thread pool. Keep in mind, that you will have to manually return the result to your main thread. await will not block the current thread, but only inform the compiler that it is necessary to build a states machine. However, Task.Wait will block the thread and may event result in an interlock (see ELMA1835). Here you are going to end up with an interlock. Because the getter of the Result property will block the thread until the async operation is completed but since the async method will automatically return the result to the original thread and ASP.NET uses the single-thread synchronization context, they will keep waiting for each other. A similar issue may arise with WPF, Silverlight or C#/XAML applications in Windows Store. You can find more information here. For example, use object instead of Object, string instead of String and int instead of Int32. These aliases were introduced to make primitive types first-class C# members, so use them properly. Exception: When referencing static elements of such types a full CLS name is usually used, for example, Int32.Parse() instead of int.Parse(). The same applies to methods that specify the type of the returned value. For example: ReadInt32, GetUInt16. These recommendations apply to localized resources, such as error messages and menu text. Use the pascal notation for resource keywords. Prefer descriptive names to short names. Make names brief, but keep readability. Use only letters and numbers when naming resources. For example, connection strings, server addresses, etc. Use resource files, the ConnectionStrings property of the ConfigurationManager class or the Settings class generated by Visual Studio. Maintain relevant values of the settings via app.config or web.config (not somewhere else). Configure your working environment to use the fourth warning level for the C# compiler and enable the option "Treat warnings as errors". It will allow compiling the code with the highest quality possible. Make sure, that attributes for the company name, description, copyright warning, etc. are filled in. One of the ways to make the version number and other common for all assemblies fields always the same is to move the corresponding attributes from AssemblyInfo.cs to the file SolutionInfo.cs, which is used by all the projects in the solution. In addition, LINQ-queries must be divided into several lines for readability. Thus, the second expression looks more compact. The dynamic keyword was introduced for working with dynamic languages. Using them creates a serious performance bottleneck, since the compiler has to generate a certain amount of additional code. Use dynamic only when referring to members of a dynamically created class instance (when using the Activator class) as an alternative to Type.GetProperty() and Type.GetMethod() or when working with COM Iterop types. Tip: Even if you need .NET Framework 4.0 you can still use async and await. Simply install Async Targeting Pack. 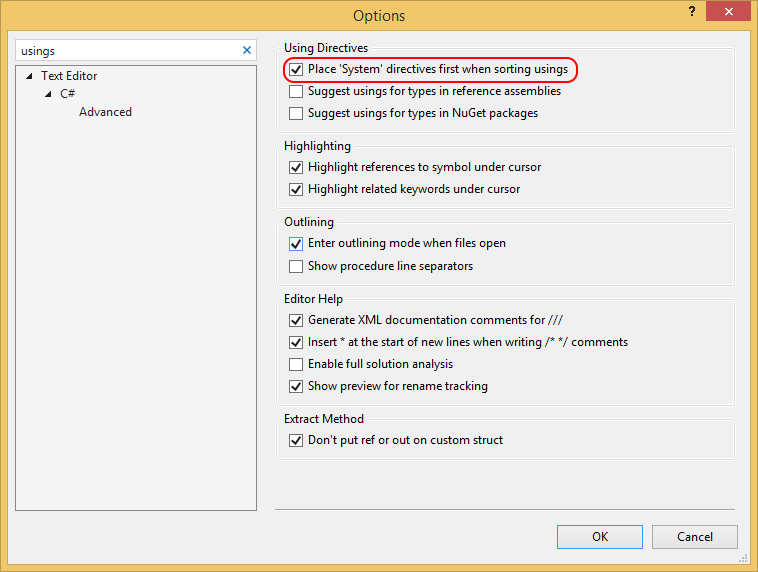 Documenting your code will allow Visual Studio to show tips when your class is used somewhere else. Additionally, when your classes are well documented, you can generate document to your code, which looks professional. Write XML documentation bearing other developers in mind. Maybe he or she will not have access to the source code and you need to better explain how to use your type. Adhere to the MSDN online Help style to help other developers figure out your documentation quicker. Tip: GhostDoc can generate xml comments for creating documentation with hotkeys. If you need to clarify a fragment of code with a comment, most likely you should make this code a separate method and give it a name that would explain its purpose. Try to make your comments answer the questions why and what, not how. Avoid explaining a code fragment with words, instead help the person who will read your code to understand why you have chosen this solution or algorithm and what you are trying to achieve with it. If you select the alternative, if possible, also explain why a simpler solution caused trouble. It may seem a good idea to add a TODO comment to a code fragment to track work that should be done later. In fact, nobody needs such comments. To track incomplete work, use a task tracking system such as Team Foundation Server. Keep lines under 130 characters long. Use 4 spaces as indents instead of tabulation. Use one space between a keyword (e.g. if) and an expression but do not use spaces after (and before). For example: if (condition == null). Always use the structures if, else, switch case, do, while, for and foreach with paired braces, even if it is not necessary. Always open and close paired braces in a new line. Start a LINQ-query with declaration of all the from expressions and do not mix them with other expressions. Add an empty line between multiline expressions, multiline class members, after closing paired braces, after unrelated code blocks, before and after the #region keyword and between using declarations, if namespaces have different root namespaces. Static directives and aliases must be declared after all others. Always place using directives at the top of the file, before declaring namespaces (not inside them). Keeping your code in order helps other team members read it. Generally, you read a source code file is from top to bottom, as if you were reading a book. It prevents a situation when you need to view a file upward and downward looking for the required fragment. Declare local function at the end of the method, in which they are declared (after the rest code). Private fields and constants (preferably in Private Definitions region). It tells you about all the aspects of software development in detail. Despite this book was written in 2004, you will be amazed how relevant the information in it is. Here is a review of this book, written in 2009. Another great journey through many practices preached by such methodologies as Scrum and extreme programming. If you want to quickly familiarize yourself with these methodologies, read this book. Domain-Driven Design (DDD) and Testing-Driven Development. Despite the blog being not that active, there have been terrific articles on testing-driven development, patterns and design principles over the last couple of years. A set of guidelines, to which you should adhere when creating a custom implementation of the IQueryable interface.